It is hard to believe that just over one year ago Scientific Adventures for Girls (SAFG) launched its pilot program at Curiosity Hacked's space in Oakland with 15 girls. Since then SAFG has expanded its reach to six programs at four different sites in the East Bay. While carefully observing and processing the lessons learned from every program, we are reassured that our mission of keeping our young girls and naturally born scientists engaged, confident and prepared for the 21st century is critical to achieving a more gender equitable, more productive society. Do you remember as a child who you wanted to be when you grew up? I do. I wanted to be an Avon Lady! Our neighbor was an Avon Lady, and she often came by trying to sell my mother make-up. Apart from my mom and dad, the Avon Lady was the first person I encountered who exposed me to a new idea for a “grown-up” job. What never entered my world as a young girl were words like “engineer” or “mathematician”. Even perhaps more detrimental -- I had teachers who discouraged girls from math and science, paying more attention to the boys in my classroom, thus validating the idea in my head that boys are better than girls in math and science. The absence of female role models around me and in the media also supported this view. While many gains have been made in whittling down the gender gap in STEM activities and careers, there is still a lot of work to do. Current research shows that children as early as in kindergarten are developing negative views of science; girls are losing interest in science by 4th grade; and although they are taking STEM classes and excelling at them in high school, a low number of girls are aspiring to go into STEM fields. We cannot afford to perpetuate this gender bias that still exists. Statistics predict that 85% of jobs in the near future will require STEM skills – so not even jobs in STEM, but all jobs. Women in STEM careers earn on average 33% more than their non-STEM counterparts. With opportunities in STEM careers growing exponentially, our girls will miss the boat. The income gap and the gender gap will widen – especially in computer science and engineering. We need to keep up. We created SAFG to join the global movement to keep girls (and I say “keep” because we are all born with an innate curiosity and urge to explore) excited about STEM and normalize STEM. STEM is NOT just for the eccentric, crazy white-haired man, geeky, loner girl, or genius. STEM is everywhere, and we should mirror this paradigm shift in the way we teach STEM, especially to girls. Learning how to make observations, to think critically and how to employ the scientific method is useful for everyday life – not just in science class! SAFG also understands that in light of the subtle or not-so-subtle gender biases girls face, not all girls come in with the same life experiences to draw upon. So we invite female role models in STEM to meet with our girls to show them they, too, can turn their passions into jobs! Because 85% of the girls in our pilot class have continued through three additional programs, we have witnessed first-hand how our program has achieved these outcomes. The girls ask such profound questions and they are not just about what is happening in class but how the project is relevant to their world in general. Our hope is that they take these skills and sustain the excitement through their middle school, high school and college years and potentially careers in STEM. We have young daughters, and as parents we want to give them the space to thrive and discover their potential. We want them to know they are amazing and they can be whoever they want to be before the world tells them otherwise. One of SAFG’s goal is to normalize STEM and aims to make science just as fun as soccer or ballet. We believe that enrichment programs like ours should be accessible to everyone - so every girl has a chance to realize her dreams. We want to show them that science is all around us. It is the ant colony at the park or it is the spaceship waiting to be built in your recycling bin. This 2015 academic year we offered three 10 week sessions to girls in Kindergarten to 2nd grade and 3rd to 5th grades engaging in projects from extracting DNA from a strawberry to learning about pump mechanisms by taking them apart. Most recently, SAFG implemented a new unit to connect the girls' keen interest in animals to technology and engineering. The girls explored how we can innovate sustainable solutions to human problems by learning how animals have adapted to the environment, e.g. why beavers are efficient engineers and how bees are super structural engineers by observing and emulating honeycomb structures! We were thrilled to partner for the first time with Girls Incorporated in Alameda and provide STEM programming during their "Smart" series. For ten weeks SAFG teachers facilitated hands-on projects covering different disciplines such as designing, creating and iterating gliders made out of foam meat trays (aerodynamics); going out in nature and observing the symmetry and patterns in Romanesco broccoli or pinecones (mathematics); and making electric play dough and powering LEDs and motors (electrical engineering). We are excited to partner with Emery Unified to provide STEM programming for girls at Anna Yates Elementary. We provided one 10 week session in the winter and are currently offering two 10 week sessions to girls in Kindergarteners through fifth grades. 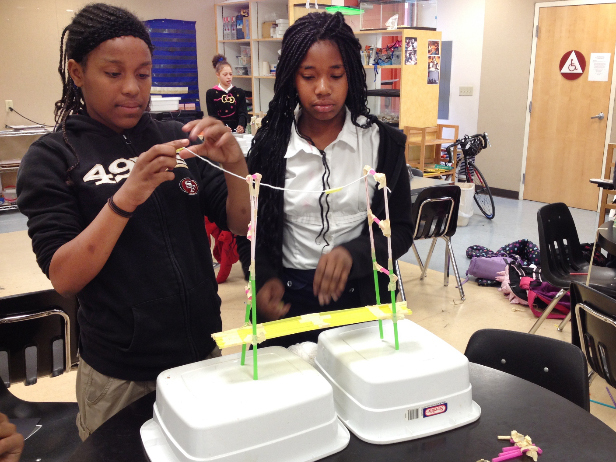 We were pleased to see many girls from the pilot class re-enroll in the second session engaging in projects such as coding, making super bouncy balls (chemistry) to designing and constructing bridges out of straws, paperclips and tape (structural engineering). SAFG continued to expand its reach by partnering with the El Cerrito Recreation Department for the first time and offering a 9 week spring session for girls in 1st to 3rd grades at Harding Elementary. 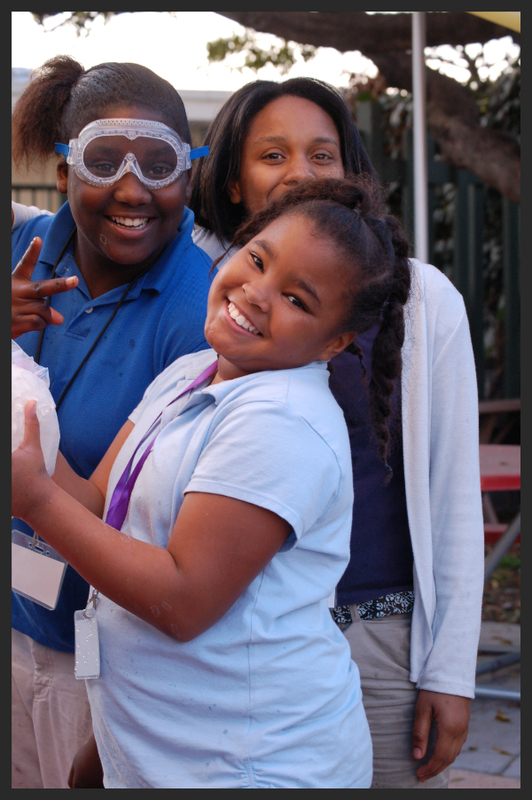 As pictured to the left, girls learned about non-Newtonian fluids and had fun making Oobleck. 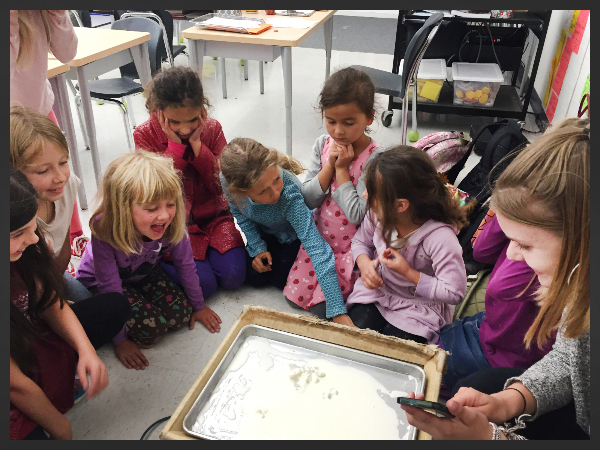 They made Oobleck "dance" by placing it over a subwoofer producing vibrations. SAFG raised over $15K from our GoFundMe campaign and from personal donations over the last few months. This money helped SAFG offer the winter and spring programs. We have recently added a page to our website (http://www.scientificadventures.org/donate.html) that allows everyone to donate to SAFG, as we will be closing down the GoFundMe account. Thank you to everyone who made a donation! We received our 501 (c)(3) non-for-profit status in March, which means that all donations are tax deductible. This is retroactive to November 2014. We are now in the process of applying for grants and seeking corporate contributions to support our programs. If your company is interested in our mission and you would like to put us in contact with the person who handles philanthropy at your company – we would be very appreciative. Thank you again for your support and stay tuned for more progress updates. Anne Mayoral is a former rocket scientist and currently an industrial designer. She earned her Masters of Science and Bachelors of Science in Aerospace Engineering from the University of Texas at Austin. She is also co-owner of the ArtBot Toys, a toy company founded to connect kids and STEM fields at an early age. Sonia Rawal has worked with children for over 30 years. She earned her early childhood teaching credentials and has been teaching at Dandelion Cooperative Nursery school in Berkeley for the last six years. She is a strong proponent of inquiry-based learning and project-based learning. Rachel Anderson is a graduate of the University of California - San Diego, trained in ecology, behavior and evolution with a side of physics. She worked for three years in veterinary hospitals as an animal technician and practice manager and spent seven years as a science program coordinator for the Denver Zoo, designing, delivering and evaluating standards-based educational programs for children and adults. Jeannie Koops-Elson has worn several different hats in her professional life (think community, people and non-profit development) but her all-time favorite job has been teaching Humanities at Gateway High School in San Francisco prior to stepping into family life. Jeannie is a maker and doer at heart. She also loves to design and create all kinds of textile arts and culinary delights. Isabel Odean graduated from Sarah Lawrence College, with a concentration in public health. While her passion is health, she loves all types of science, especially neuroscience. Isabel comes from a teaching background, and has worked with students in a number of capacities, including working at Sally Ride Science Camp, leading STEM programming at Girls Inc., and teaching at Head Royce School. Ginny Delaney, Ph.D. is a scientist with a passion for learning and sharing the excitement of learning with others. She received her Ph.D from Cornell Graduate School of Medical Science in Developmental and Molecular Biology. In her free time she volunteers at the Lawrence Hall of Science. Mary Ables Ray has a Bachelor’s degree in Biology and Minors in Chemistry and Psychology from Georgetown College. She has done research on sea turtles in Greece, biodiversity research in Costa Rica and molecular ecology research in Kentucky. Review the basics of chemical reactions from the SAFG film canister rockets project. 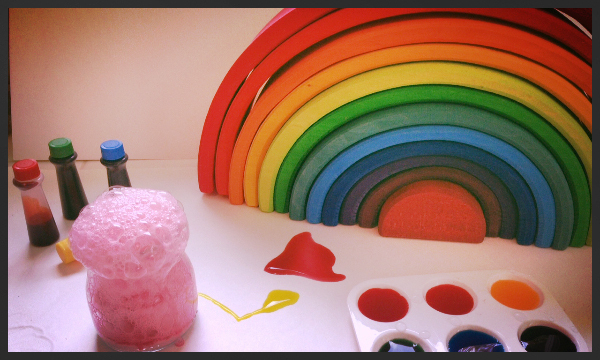 Fill the jar halfway with vinegar, then add a few drops of one color of liquid watercolor / food coloring and some glitter. Squeeze in some dish soap, stir and place the jar on a tray. Now have your child add in a heaping teaspoon of baking soda, stir again and watch the foaming begin! The soap makes it foam rather than fizz. To keep the reaction going continue adding baking soda and vinegar when the foam starts to slow. To make it change colors, add a tablespoon of vinegar mixed with one color of liquid watercolor/food coloring every so often. Make sure to dump the colored vinegar into the center of the brew. Tip: Vary how fast you stir the mixture. What do you think will happen when you stir faster? What is your hypothesis? Test it out!